People with pain and/or limited use of their hands will find using this holder much easier than trying to hold multiple cards in one hand. Also includes a standard deck of low vision playing cards. 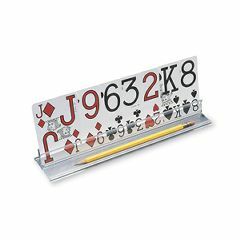 Packaged includes 4 holder trays and 1 deck of Low Vision Playing cards as shown.